Some People are intimidated by very large dogs, and rightfully so – some dogs can look real scary. But for the most part, underneath that ‘mean face’ is just a loyal dog who wants love. 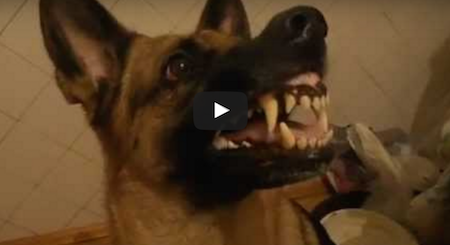 Watch the German Shepherd in the video below as he demonstrates his intimidating ‘mean face’ on his owner’s command. He goes from cute, to scary, then back to cute real quick! This ‘Babies Scared Of Their Shadow’ Compilation Is Truly Hilarious! Man Accused To Smuggling Drugs Inside His Dog, How It Got There Will Shock You!